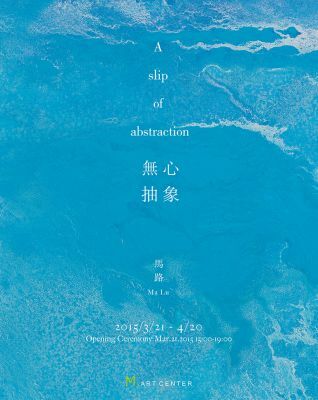 M Art Center is thrilled to present you the solo exhibition of our artist Ma lu, A slip of abstraction, from March 21th to April 20th, 2015. Ma Lu’s creations have their origins from abstract expressionism, in a way not pursuing analytical method of the western abstraction research. His works do not emphasize geometrical relations on canvas like Mondrian and Malevich. Nor do they reveal some hidden libido like drip paintings by Jackson Pollock. His philosophy seems to be a way in-between, one which is more related to the physical experience of normal people. His works go beyond the simple form and shape of things around us,but they express his feeling towards them and his physical experience of them. When Ma lu found the corner stone of his artistic expression, one that lay in the emotional transformation deeply rooted within him, peace is found in his heart. His works convey not only the image of a theme, but also a purified whole reflection of reality, with similar magic of music and of poetry. Whatever and however it is that he paints: heaven or earth, man or animal, big or small, figurative or abstract, all is important, with no difference, free from the other in its own right, yet they infiltrate into each other’s world with comments and remarks, where a micro and a macro view share the same expression. In fact, Ma lu has no intention to be neither abstract nor figurative. The point is not about to paint with or without the imagery, but about to paint freely. Only free painting without intention could produce the genuine and natural image. What Ma lu’s saying is not to do nothing, but to do with the least intention!